First, we shall look at his breakthrough film, Memento (2000). This film was ranked rather highly in my look back on the best films of the 2000’s, but it’s also one of those films that never holds up as well as my memory of it, which is rather fitting, as it’s a film all about memory and the false ones we create for ourselves. Watching it the other night, what really stands out (aside from the gimmick of being told backwards from the point-of-view of a protagonist with short-term memory loss) is how tightly Nolan controls the narrative and constructs the film. For a film with a plot so jumbled, it’s shockingly linear (spare for the interwoven “telephone” sequence), and the way in which Nolan uses different shades and coloring to indicate the veracity or location of a moment is next to brilliant. If his first film, Following, set the template for the types of stories he wanted to tell, then Memento set the template for his constant strive towards perfection. He didn’t reach it here, but, man, what a rock-solid little indie film this is, and what a perfect harbinger of what was/is to come. Short-term memory quickly fades, and what lasts is that long-term memory of my first watching Memento in the theater and thinking, “Whoa.” When our antihero Leonard closes the film with his internal monologue stating, “I just want to know that when I close my eyes, the world around me won’t disappear,” Nolan revealed to us his ever-evolving obsession. At one point, Leonard refers to his condition as something like a dream…and, well…Nolan always planned on dreaming big. This brings us to a film about the absence of dreams and being haunted by waking nightmares…Insomnia (2002). Here, Nolan showed he could work within the Hollywood studio system, get a pair of nearly washed-up A-listers (Al Pacino and Robin Williams) to deliver their last great performances before diving into the abyss of “what happened to their careers?” and set the template for how remakes should be done. Adapted from a Norwegian thriller about a world-weary cop hunting down a tricky killer during a nightless summer near the arctic circle, Nolan changed the locale to Alaska and married the themes to mirror his own obsessions – mainly coming to terms with sins of the past by examining one’s own falsification of evidence and memories – in a place where the light of the sun and the light of truth shines on everything and everyone. When Pacino’s detective comes clean to Maura Tierney’s hotelier about the lengths he went to secure justice, it’s quite possibly the most emotionally charged and soul-purging scene Nolan has ever delivered. Often dismissed because of its adherence to rote cat-and-mouse theatrics and hampered with the remake label, Insomnia, with all of its overt symbolism and gorgeous Alaskan scenery, is Nolan’s most underrated film. It also set the template for how Nolan would accept the assignment of rebooting a comic-book hero franchise. By showing Hollywood how a remake should be done with Insomnia, he was setting the stage for making Batman his own. Nolan’s mysterious and brooding tale of dueling magicians hangs on the notion of fooling the audience and that big twist, but it’s in the mechanization of the turns where fans have found what is to be truly relished on repeat viewings. Part of the film’s success in that regard relies on Nolan’s faith in his audience, faith in our desire to be fooled, to want to wonder, in our ability to suspend disbelief. There are great performances but also some dodgy acting, the menacing (all those water tanks) combined with the silly (all those hats), and the tightly wound turns choking any sign of plot holes and the ultimate simplicity of the prestige. It is here where Nolan announces himself as an auteur in complete control. But he only has that control if the audience is willing to work in tandem in a communion in the darkened theater. We must dare him to fool us. And he must not disappoint. This entry was posted in Inspiration, Movie Reviews, Movies, Pop Culture, Psychology and tagged Allan Fish, Antiheros, Batman, Christopher Nolan, Favorite Directors, Following, Inception, Insomnia, Magic, Memento, Memory, Movie Magic, Neo-Noir, Psychological Thrillers, Remakes, Template Films, Wonders in the Dark. I’ve just seen the repeated trailers on tv. Are the reviews that bad? I guess I’ll go check. I love Nolan too, though I think all of his films contain one major flaw (distinct in each film) that holds each back from true greatness. But I like that, because he keeps reaching, and true ambition has become so rare in Hollywood (excluding the people at Pixar) that I look forward to his next film like a dog salivating for a meal. The only thing I dislike about Nolan is — and this isn’t his fault — the Rotten Tomatoes flock of sheep that have gathered around him. I read David Edelstein’s pan of Inception and while I obviously can’t agree or disagree, I think he defended himself well and the points he leveled against it are flaws I’ve seen in other Nolan works. But he’s tarred and feathered by people who haven’t even seen the film, who just want to believe in marketing hype (yeah, everyone, keep bashing critics for being out of touch when you’re nothing more than pawns). That mentality viciously stomps out dissent, and it actually encourages the true trolls like Armond White, who wrote such an incoherent mess that I think his editors didn’t so much neglect to proofread it before publishing but refused to. I love TDK enough to see the issues with it, and I wish people could step back long enough to stop following the soul-crushing wave of manufactured hype. That is the opposite of love for cinema. David, this post is so timely for me as I just watched “Memento” for the first time 2 nights ago. 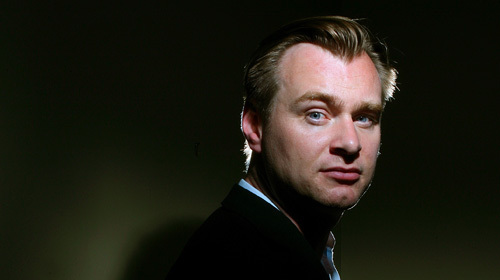 I think Nolan has a great talent, but, as you say, the end products don’t always match up with the promise. I was really into “Memento” for about the first act, but the whole structure got overbearing and tedious. Though I loved that he had the creative guts to go out on a limb with a story like that. And I have to admit I didn’t see the end coming. I knew there was some kind of twist but I had a hand-slapping-the-forehead moment when I realized I should have seen it coming. I think “The Prestige” and “Dark Knight,” both flawed movies, are his best. (I haven’t seen “Insomnia for years and I think I was being snobby when I saw it because I really loved the original.) I’m curious to see “Inception” hopefully this weekend. It will be interesting to see whether we agree or not. I’m just curious, what are the major flaws you guys see in all his movies? Dan – good question. I find he relies too much on expository dialogue, and his dialogue can sometimes come across as unrealistic and occasionally silly. His screenplays feel the need to explain EVERYTHING, which ties into the overuse of expository dialogue. Also, although he has corrected this, initially, his action scenes were choppy and hard to follow. And again, this has also been improved, but some of his films are too darkly lit for my tastes. All that being said – those are minor quibbles and things that I believe he is aware of and has tried to work on. Otherwise, I love his stories and his style and his ambition.